Just wanted to drop by to draw your attention to these two cuties. I won't wax on again about my longstanding love affair with the daybed, but if you are unfamiliar you can hop over to this post to get up to speed. First up is this fantastic piece from West Elm. It's part of the Parsons line of furniture -- which is all genius. The styling here is very pretty as well (except for those lame cushions on the floor on the left -- what's up with those? How come nobody in creative said -- what's up with those, let's photoshop them out.) But I digress. I could also see this done up with some pretty block prints. ...like the lovely Chatri quilt and sham combo from John Robshaw. And speaking of block print quilts I've got a little beef with West Elm over its discontinuation of almost all of its print quilts. Makes me sad. If you are quick you'll still find some for sale on the web site. And here's the Parsons daybed all naked so you can see the bonus -- a trundle bed. Yay, so perfect! And then there's this excellent piece, the Jamie daybed, from West Elm's sibling PB Teen. I don't mind revealing that it's a bit of a favourite secret source. No need for kids or teens in your life to find good stuff there. The task lighting, carpets and some of the bedding all have appeal beyond the teen demographic. Mind you, the styling here definitely says "teen". It's much easier to imagine the possibilities of this thing -- and to see its virtues more clearly -- when it's stripped back. Love that it has a back (so much better if you need it to do double duty as a sofa) and because it's upholstered and slipcovered it looks a bit more substantial than the WE version. This one comes in full (shown) or twin size. This is the NYC studio of Ellen O'Neill. The daybed is upholstered in a muted toile but what I really love is the undoneness of this styling. We in the print biz can't often get away with this sort of thing. But O'Neill is a styling superstar. Trust me, if you consume design you've seen her work often and her own homes even more. I tip my hat to her, to photographer Thomas Loof and to House Beautiful for this wonderful editorial. You can see the rest of it here. PS. Just in case you were wondering, this is not a sponsored post. No posts here are sponsored, ever. I take no advertising and I write what I like. That's all. Ole' Resto has done some whack stuff over the last couple of years. But this lovely, the Devyn Tufted Daybed, is making up for all that. A daybed never has to work too hard to win me over. Current number in the Austin personal inventory: five. Yes, that's right, five! Admittedly one is in storage. Four of our daybeds are on full active duty. 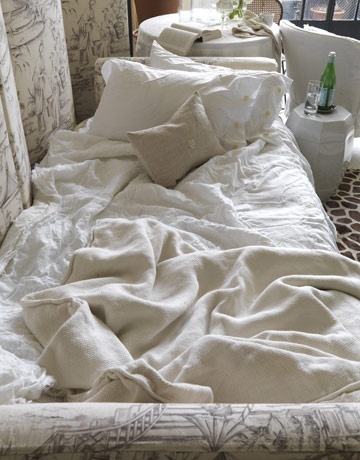 Why do I love a daybed? 1. It's a sofa AND a bed. 2. More comfortable to sleep (or sit) on than most pull out sofas. 3. Endless opportunities for pillow design and styling. 4. Amazing for kids' rooms (since they are also great to hang out and laze around on). 5. Perf. for a home office that needs to accommodate occasional overnighters. 6. So cozy for a family room/TV room, since everyone can snuggle up (and so much more chic than a sectional). 7. Little known fact: also perfect as spot for packing suitcases: enough room to open the suitcase and layout all the clothes you need around it so you can make your final packing decisions. Devyn is all these things and so much more thanks to the luscious tufting, the swooping arms that make it wing chair-like (another of my loves), and it comes in Sand linen and Fog velvet -- yum and yum. And last but not least, please take a moment to enjoy the unbelievable styling of those bed linens! We are def having a loose styling moment when it comes to beds. The keen creative squad at RH were no doubt trying to make this thing seem a little more 'tween/teen by styling it louche and relaxed (hello headphones). It's dreamy. When I transform one of our daybeds into sleeping mode I usually skip the putting onof sheets and such. 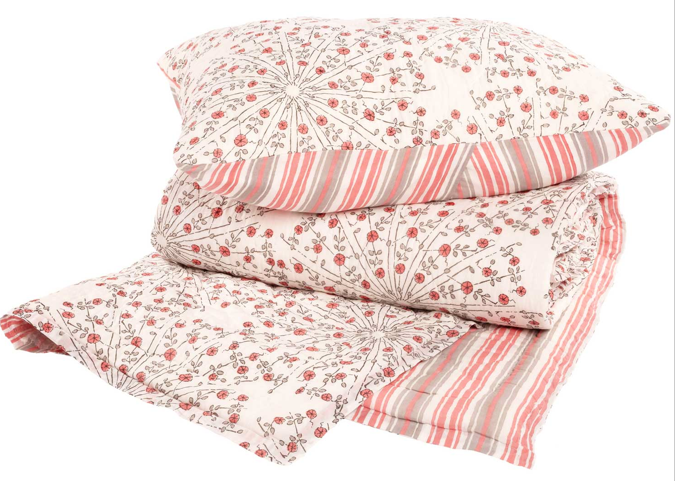 Instead, I either fold a large queen duvet in half lengthwise like a luxurious sleeping bag or I just put one full duvet on the bottom and one on top and then add sleeping pillows. It's way less fuss to make and then to wisk away the next day. Imagine how different Devyn would look with snug-fitting plum velvet mattress cover and a mess of velvet cushions. Or tweeds and tartans. Or ombré linens. Or a tumble of kilim and suzani cushions...honestly, the possibilities! (see no. 3 above). RH, welcome back. All is forgiven (well, maybe not quite ALL...but close).